There are two things that the Internet loves above all else. Cats and ninjas. Ninja Kittens, developed by Won O Soft brings together these two memes into the one iPhone game. Starring black-clad fighting felines, Ninja Kittens in a super fun gaming experience. 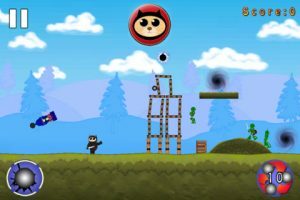 For this review, I checked out the game on my iPhone 4S, but it’s worth noting you can also play Ninja Kittens on the iPad as well if you want a larger screen to play on. It’s something I’d definitely recommend: the screen size of my iPhone was a bit problematic, and the controls and game area seemed really cramped, almost to the point of being too hard to play with ease. 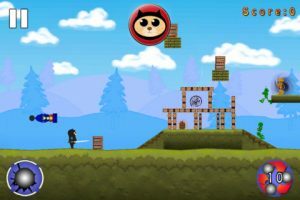 Inspired in part by the gameplay mechanics of Angry Birds and Crush the Castle, the goal of Ninja Kittens is to fire projectiles at both blocky structures and rampaging squads of evil robots. You have 45 levels of this kind of fun to look forward to, and sometimes you even get a chance to use more than one cannon to fight the oncoming foes. 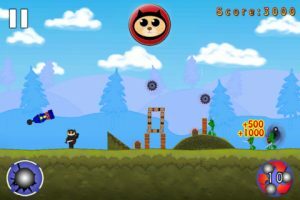 One feature of Ninja Kittens that’s really neat is the way that poor shooting on the part of the player can create shortcuts for the robot army to get to the kittens even faster. This gives you the impetus to shoot both quickly and cleanly at your targets. 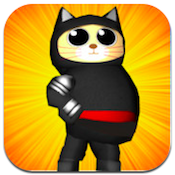 The App Store description for Ninja Kittens boasts that the game has a “powerful physics engine to ensure realistic and responsive gameplay.” That feels true when playing the game: the physics just feel right, in a way that a lot of games in this genre get wrong. Bottom line: Ninja Kittens is a must-play for fans of Crush the Castle and that style of game. Just beware: the iPhone and iPod Touch screens may be too small to make the gameplay experience truly exceptional. 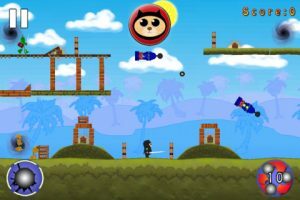 Ninja Kittensis compatible with iPhone 3GS, iPhone 4, iPhone 4S, iPod touch (3rd generation), iPod touch (4th generation) and iPad. Requires iOS 5.1 or later. A small expedite fee was paid by the developer to speed up the publication of this iPhone game review.